Ned Meerdink (Sos Femmes en Danger – SOSFED): Ned earned his Bachelors degree from the University of Wisconsin-Madison, where he studied humanitarian work in Central and Eastern Africa. 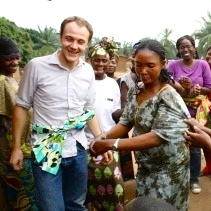 After graduation, NED worked for human rights NGOs in the US and Congo. They included Mutuelle Jeunesse Active (MJA) in Sud Kivu. AP deployed Ned to Uvira, in South Kivu, in September 2008 to work with civil society organizations including Tunza Mazingira, Arche d’Alliance, and SOS Femmes en Danger. Ned launched the partnership between SOSFED and AP in 2009. SCHOOL IS AROUND THE CORNER, BUT WHERE ARE THE UNIFORMS?